Democrat Rocky Adkins said Thursday he’s more encouraged than ever about his chances in Kentucky’s gubernatorial race. 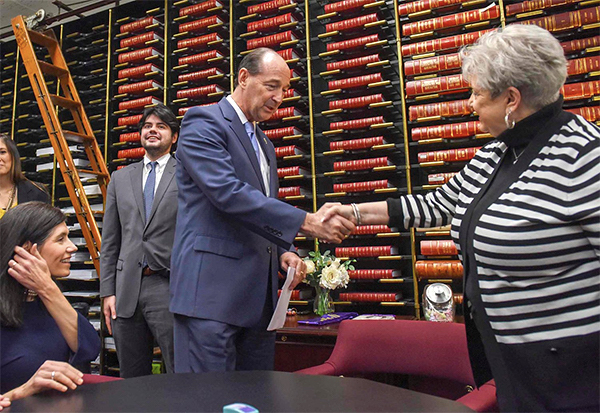 Adkins, the veteran lawmaker from the Appalachian town of Sandy Hook, spoke with reporters after he and his running mate, Stephanie Horn of Louisville, filed candidacy papers in the secretary of state’s office. “We’re in this race to win it,” said Adkins, who raised $620,000 within weeks of announcing his intention to run last November. Adkins promised Thursday to “bring respect and decency” to the governor’s office. Adkins is the third Democrat to file for governor. Attorney General Andy Beshear and former state employee Geoff Young are the other two. Former state Auditor Adam Edelen has said he intends to run but hasn’t filed yet. Adkins, who is making his first bid for statewide office, is marketing himself as a candidate who can win the support of rural Democrats who have been throwing their support to GOP candidates. Adkins has spent more than three decades in the legislature, including a long stint as majority floor leader. Horne is an attorney, businesswoman and former Jefferson County school board member. On the GOP side, two longshot candidates have filed to run against Gov. Matt Bevin.